I try to cook at least 3 days a week and also make sure there is enough for leftovers the next day. Somedays I enjoy braising meat that can take hours. Other days I just want to make something fast and easy that only takes about an hour. Last night was a fast and easy night. The bad thing is most fast and easy recipe end up without a lot of flavor. Yesterday I wanted a fast chicken recipe so I searched my Pinterest. I found Martha Stewart's recipe for Half-Hour Chicken Gumbo. This recipe was fast and easy because the ingredients are a rotisserie chicken and pre-cooked andouille sausage. I love chicken recipes that call for rotisserie chicken because it cuts the cooking time but still keeps great flavor. The only problem is I read the comments and people complained that this gumbo was really bland. I did notice that the only spice in this recipe is 1 teaspoon of oregano, which does not make me think of gumbo. 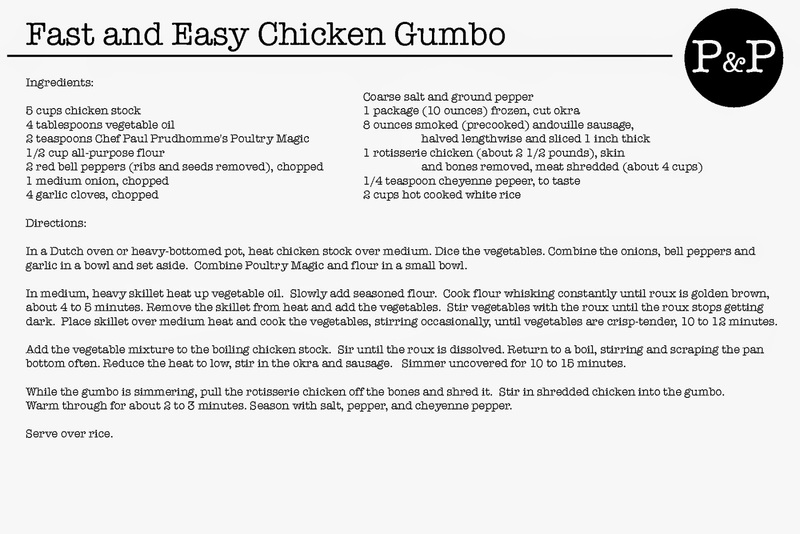 I thought why couldn't a take a really great gumbo recipe and use rotisserie chicken and pre-cooked andouille sausage. When we make a Turducken for Christmas we use Chef Paul's Turducken and Stuffing recipe. He is known for his Louisiana cooking. I also had leftover Chef Paul seasoning from our Christmas Turducken. I found Chef Paul's Chicken & Smoked Sausage Gumbo. This recipe has you cooking the chicken and the sausage and takes about 2 hours. It has you coat and fry the chicken in vegetable oil which is one thing I do not like. Yes I hate frying. In a Dutch oven or heavy-bottomed pot, heat chicken stock over medium. Dice the vegetables. Combine the onions, bell peppers and garlic in a bowl and set aside. Combine Poultry Magic and flour in a small bowl. In medium, heavy skillet heat up vegetable oil. Slowly add seasoned flour. Cook flour whisking constantly until roux is golden brown, about 4 to 5 minutes. Remove the skillet from heat and add the vegetables. Stir vegetables with the roux until the roux stops getting dark. Place skillet over medium heat and cook the vegetables, stirring occasionally, until vegetables are crisp-tender, 10 to 12 minutes. Add the vegetable mixture to the boiling chicken stock. Sir until the roux is dissolved. Return to a boil, stirring and scraping the pan bottom often. Reduce the heat to low, stir in the okra and sausage. Simmer uncovered for 10 to 15 minutes. While the gumbo is simmering, pull the rotisserie chicken off the bones and shred it. Stir in shredded chicken into the gumbo. Warm through for about 2 to 3 minutes. Season with salt, pepper, and cheyenne pepper.